How greedy can one girl get? I get myself a new room and now I want a screened porch off that room with one of these on it. 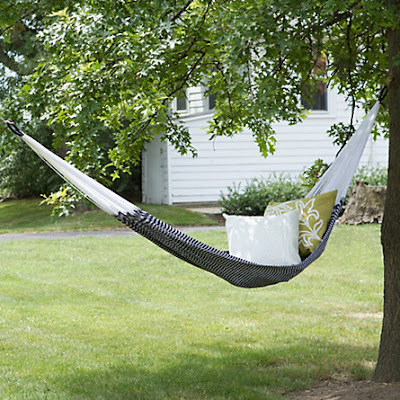 This hammock via Design Sponge. Just what I’ve been needing. But still – it was long, long, ridiculously long overdue. We’ve talked and talked about getting our act together on the issue of our wills, custody of our children in case the unthinkable happens, providing for their future needs (beyond just our own life insurance policies which we have kept up-to-date), making things as easy as possible on each other, and then our families, if something every happened to one or both of us. We attended the funerals of two parents (friends of ours) – just eight months apart – and looked at their young children and realized that talking was not acting, and there simply was no excuse. I’m going to credit M completely with getting this ball rolling, and for doing the majority of the leg work on this. After getting a glowing recommendation, we contacted a lawyer that not only specializes in estate planning, wills and trusts, etc… but one who actually wrote most of the books and founded the organization of lawyers specifically focused on these issues. It’s not an inexpensive undertaking, but well worth it. I thought it might be difficult to really sit down and think through these things, but it was quite the opposite. It was pretty freeing to just hand everything over to someone else and not have it hanging over our head. It was so comprehensive, it even includes all of our medical decisions, caretaker assignments, end of life decisions. How our estate is handled in every possible situation, for generations out. Where our important items are, how they are distributed, what are wishes are once we are gone. And the same law firm will maintain this information for the rest of our lives – updating things each year by checking in on us, and evaluating our needs as our lives progress. We put a lot of thought into almost every aspect of our daughters’ lives – from decisions on schools and churches, what we feed them and the doctors that tend to them, how to nurture their creative and intellectual selves, their clothes, their books, their toys, our house, their rooms – all of it. I mean, look at the amount of effort that goes into the simplest of birthday party celebrations and room decor! Suddenly it just seemed ridiculous to spend more time planning a three year old’s party than to actually planning for her future if we weren’t around to be there. So we just did it. And I’m going to have to say that #15 is the best thing we’ve marked off our list this year. Thanks, M, for all your late nights pulling all that information together. We’ve done it – our final meeting’s today, and now we can get back to the fun things (and enjoy each day that we are lucky enough to call our own). Here’s to many, many more of those, and to the best laid plans we never needed.